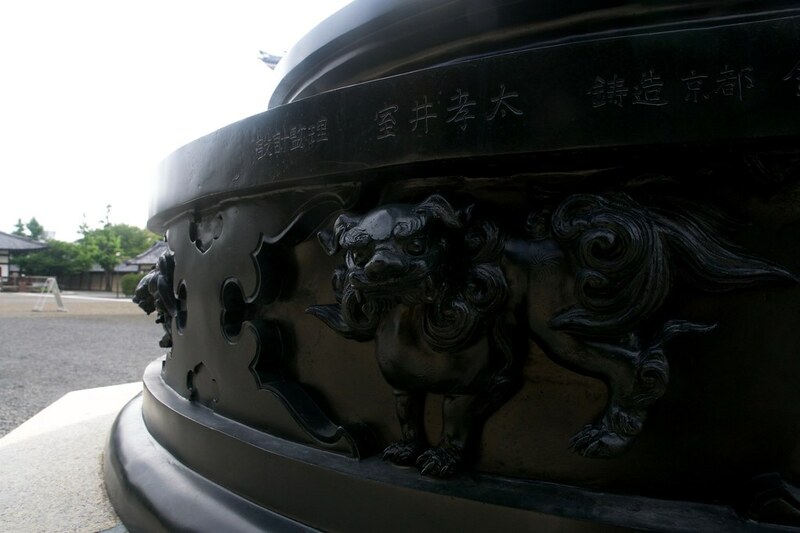 Entrance to Higashi Honganji temple, Kyoto. Every time I go to Japan, it takes a few nights to get over the jet lag. To me, those early wake up moments are an opportunity to use my time. The moment I open my eyes and see the sun is up, even if it’s 4:30AM, is the moment to get out of the bed. 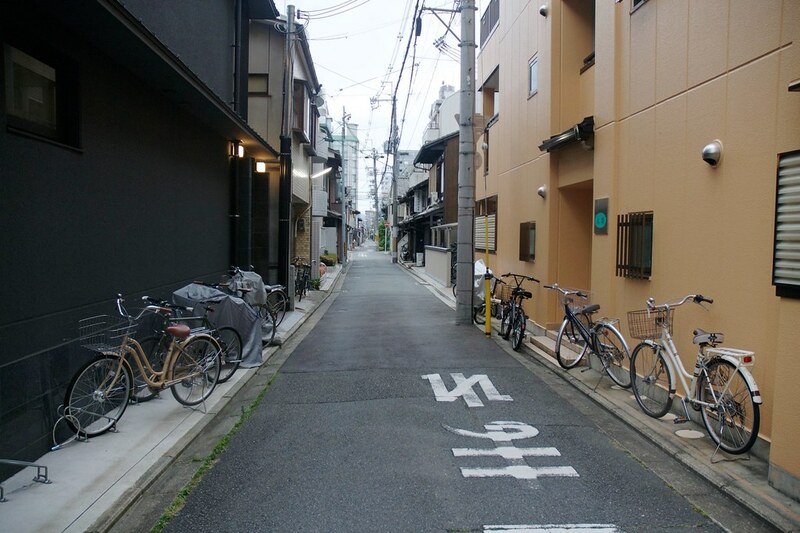 Trying not to disturb my roommates at the Takigawa Ryokan, I took my camera and left the place for a morning walk. Surprisingly, the staff at the ryokan was already preparing breakfast. Wandering early morning in Kyoto. 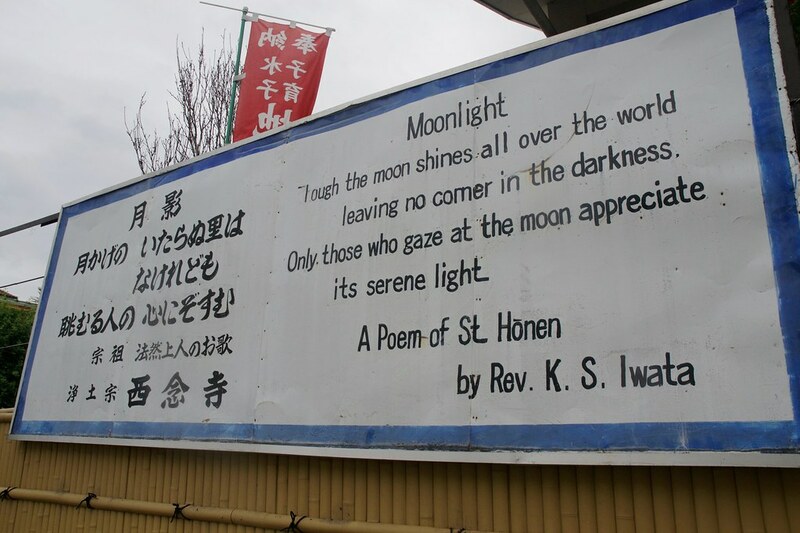 To start the day by reading a poem on a billboard in the street, good sign. Out in the streets, few people was already on their morning routine. Everything starts early in Japan. I left the ryokan without my phone or a map, the more reason to pay attention to everything around. From the day before, I knew that a few blocks on the left was the main street that goes to Kyoto Station, and on the right side, the Kamogawa river. I had two mornings to wander, so I went to the right and walked a few streets until I saw the river. 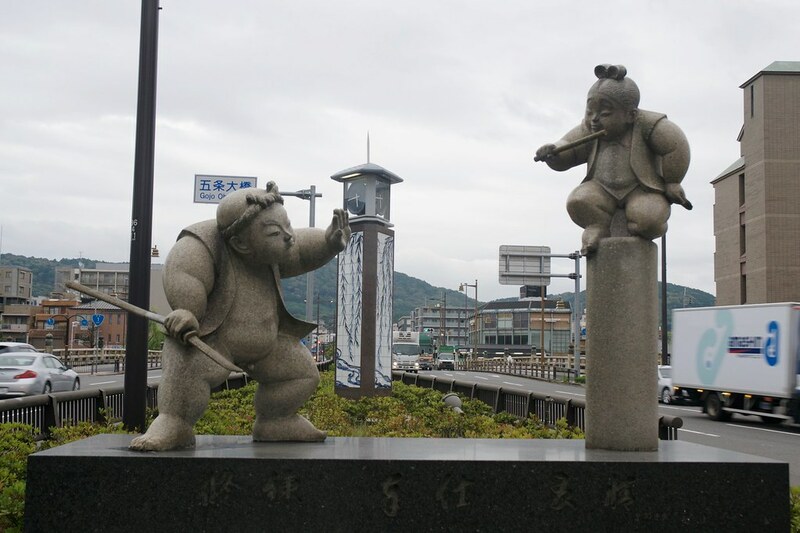 Sculptures at Gojo Ohashi bridge, Kyoto. 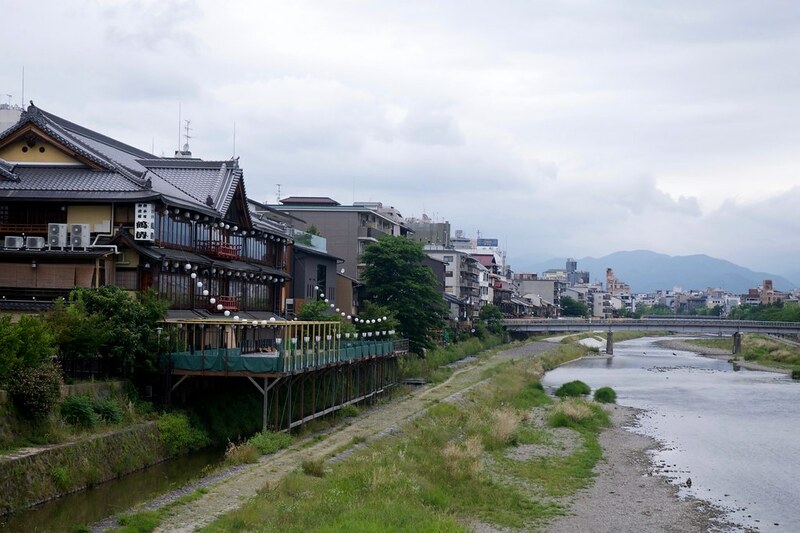 Houses by the Kamogawa river, Kyoto. 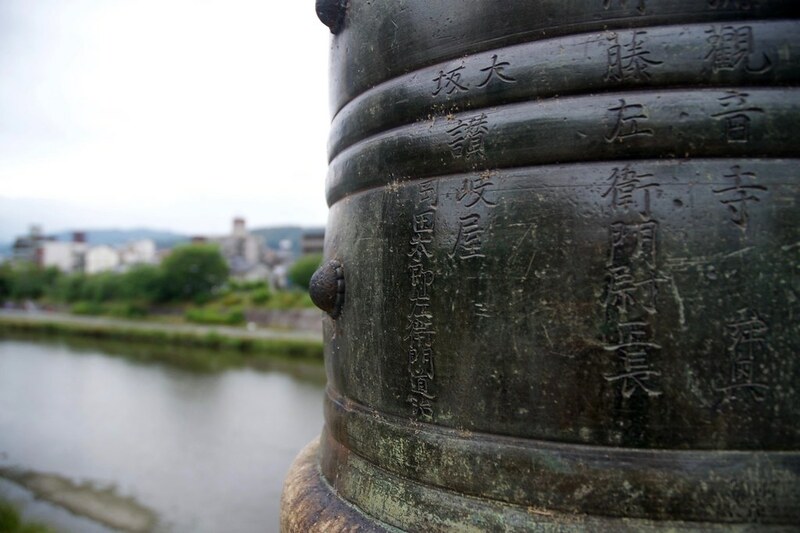 Crossed over the Gojo Ohashi bridge and walked along the riverside. Morning runners, a school group wandering in the river with their teachers, and few people walking, but wat caught my attention was an old man fishing in the river. I stayed there and observed his fishing routine, waiting. We exchanged a few words, about fish, the river, and that he came every morning as a hobby. Another man came to join the observation group, and the action started. The lively fisher caught a big one and struggled to bring it to the riverside. Once he made the capture of the day, what happened next stunned me. All smiles and joy, instead of taking the fish, he thanked for the catch and then returned it again to the river, alive. 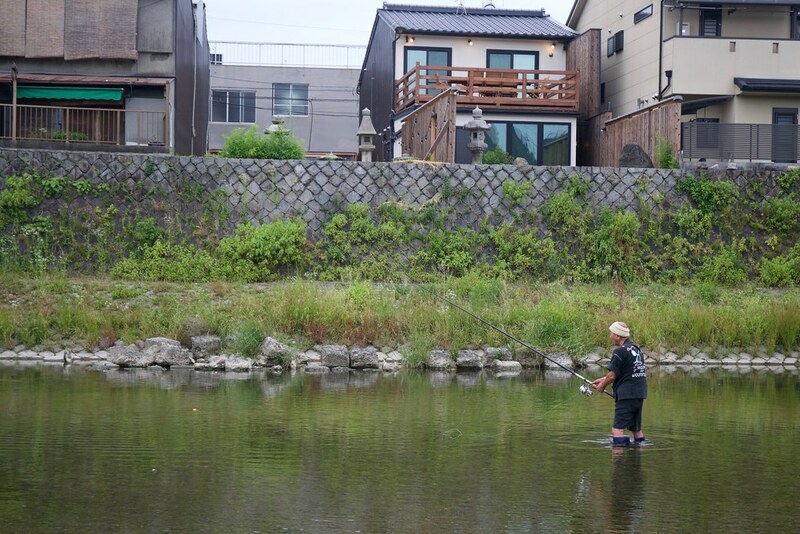 Observing that lively old man fishing reminded me one of the aspects of japanese culture, respect for nature. I did the same, thanked for the catch, my photo of the day, and departed. It was almost time to go back to the ryokan for breakfast. 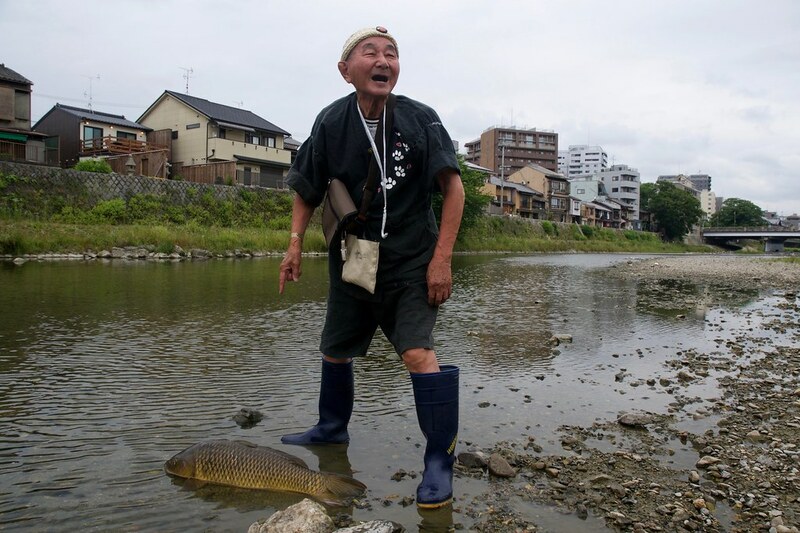 Kamogawa fishing spot for the lively old man. Capture of the day. Now to take it back to the river. 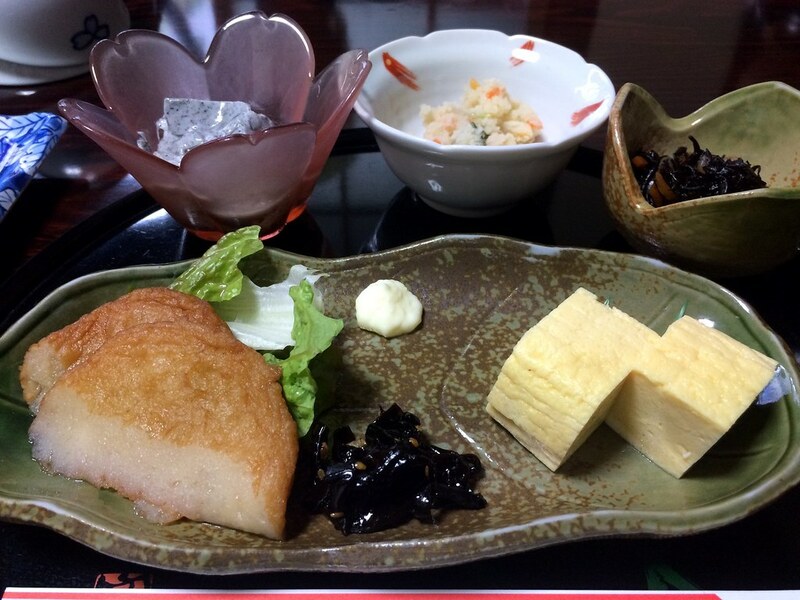 Traditional breakfast at Takigawa Ryokan, Kyoto. 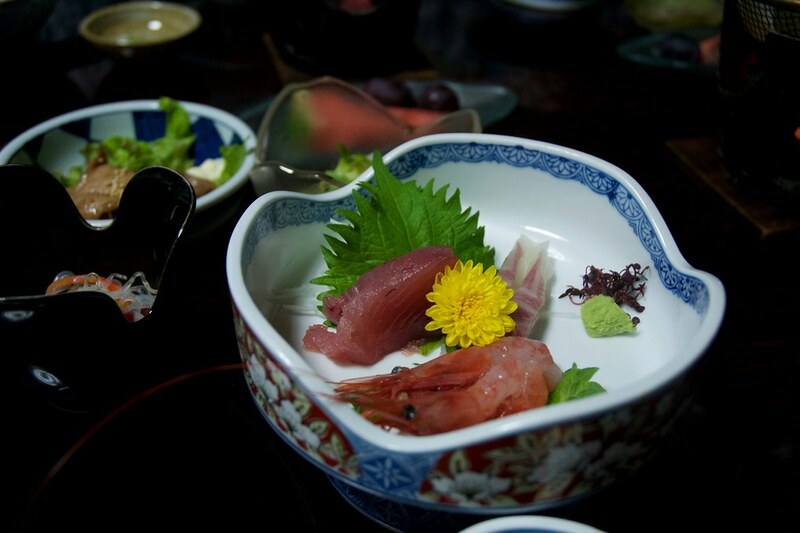 Sashimi and other traditional food is served for dinner as well at Takigawa Ryokan. On the second day, I went to the left, to visit a temple I overlooked on our way to the ryokan on the first day. Using the map I got in the tourist office, checked the name of the temple. 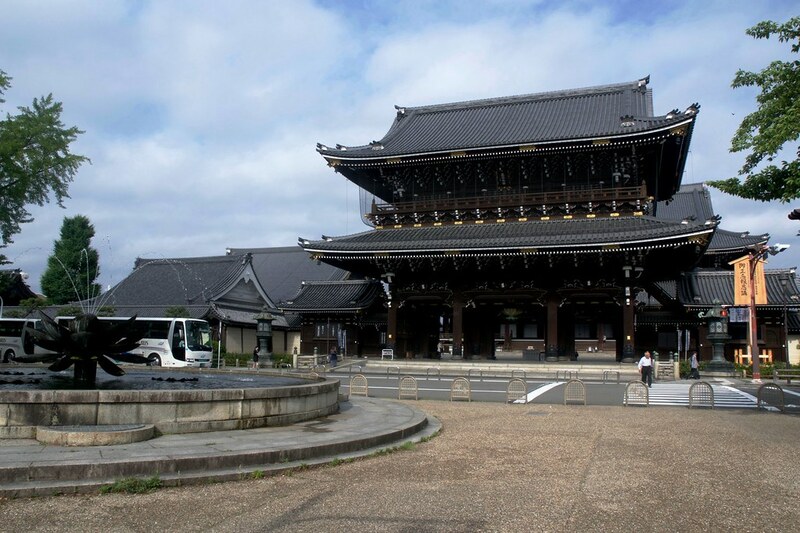 The Higashi Honganji temple, a short walk from Kyoto station, along with the Nishi Honganji temple, is part of the Jodo Shinshu sect of Buddhism. Both temples (East and West) are a short walk from each other. 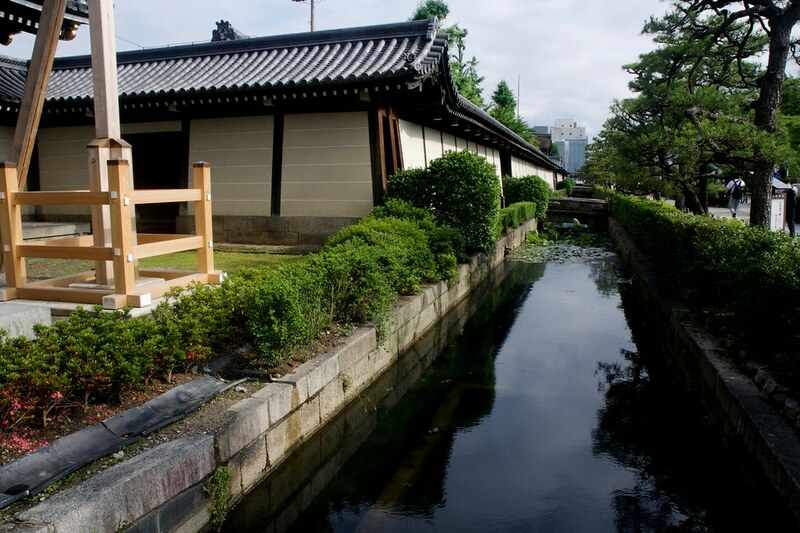 I only visited the Higashi Honganji (East) that morning. 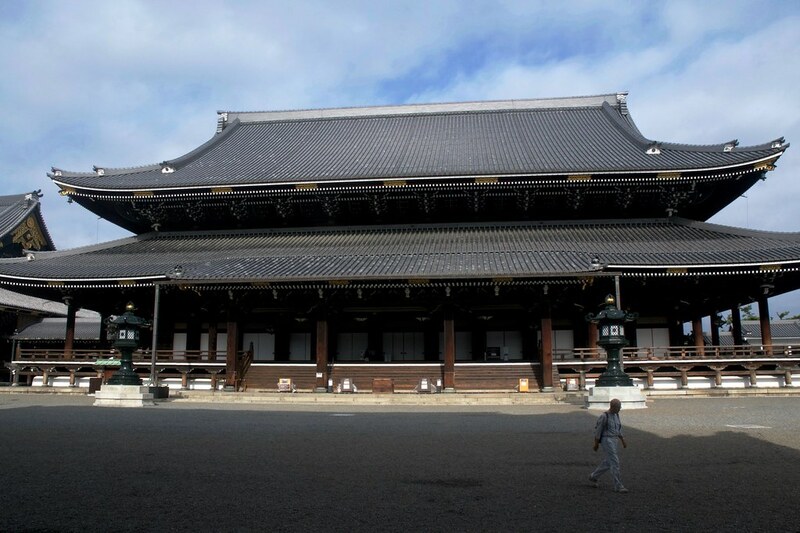 The main hall is the largest wooden structure in Kyoto, and amongst the largest of the World. At early hours in the morning, wandering alone in the gardens of the park, is possible to have a quiet sense of how it’s the temple life. Monks doing their moring routine, visitors attending the morning ceremony. I could hear the chants of the monk inside the main hall, but the doors were closed, and I didn’t want to disturb the ceremony. 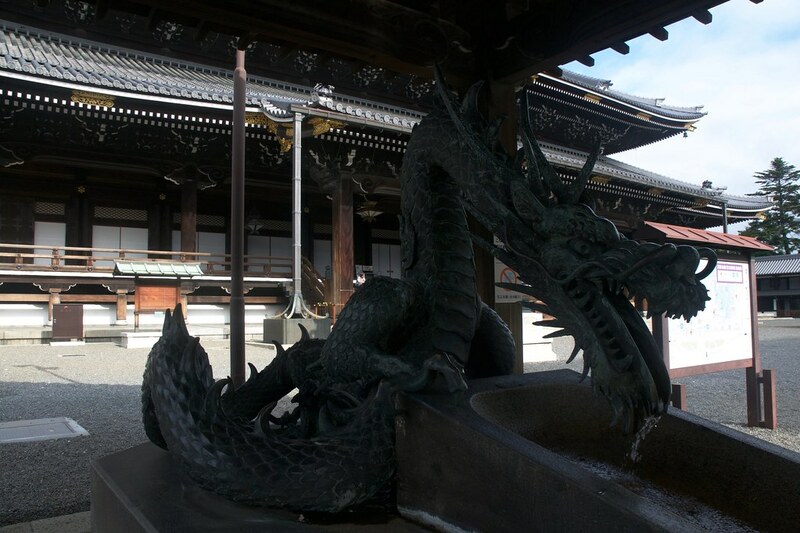 Outside of Higashi Honganji temple. Main hall of Higashi Honganji, largest wooden structure in Kyoto. After those early mornings, I could observe and had authentic local experience. Now, everytime I travel, I try to wake up as the sun rises and wander, observing the true nature of those places. 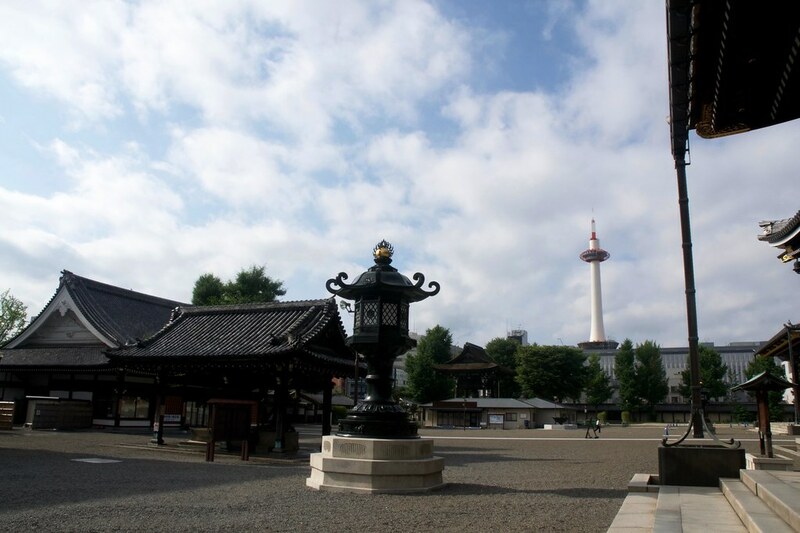 Kyoto tower can be spotted from Higashi Honganji temple, a short walk to Kyoto station.